Jayne W. Di Vincenzo, president of Lions Bridge Financial Advisors, has been recognized as a top LPL Financial Advisor and named to LPL’s Chairman’s Club. This premier award is presented to fewer than 5 percent of the firm’s approximately 14,000 advisors nationwide. Di Vincenzo has been providing financial services to clients throughout Hampton Roads and in 25 states for almost 20 years. LPL is a leader in the retail financial advice market and provides resources, tools and technology that support advisors in the delivery of personal, objective financial advice. Bon Secours Mary Immaculate Hospital has been recognized with an “A” Hospital Safety Grade by the Leapfrog Group, an independent national nonprofit run by employers and other large purchasers of health benefits. The scores were awarded in the latest update to the Hospital Safety Grade, the A, B, C, D or F scores assigned to U.S. hospitals based on preventable medical errors, injuries, accidents and infections. The Hospital Safety Grade was compiled under the guidance of the nation’s leading experts on patient safety. Michael A. Giardino, C.M. has been named executive director of the Newport News/Williamsburg International Airport (PHF). Giardino served as director of aviation with the Monroe County Airport Authority for the Greater Rochester International Airport (ROC) in New York, where he led a staff of 120 personnel in construction planning, security, maintenance and operations for the airport. 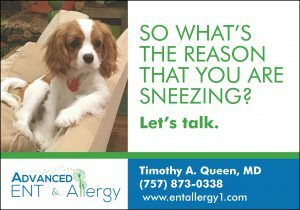 He is a 26-year naval aviator veteran, whose last command was as the executive officer for Naval Air Station Key West. Dan Chenoweth, MPA, CPA, CFA, partner at PBMares LLP, has been named chairman of the board of directors of the Virginia Peninsula Chamber of Commerce. 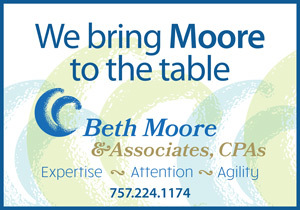 Chenoweth has been active with the chamber since joining PBMares in 2013. He served as treasurer for the executive committee from 2013 to 2017, graduated from the LEAD Peninsula program in 2016 and presents numerous accounting topics for chamber audiences. 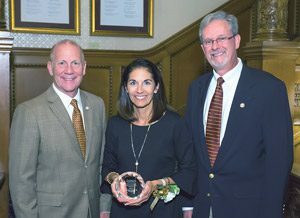 Dr. Lisa Spiller, distinguished professor of marketing in the Joseph W. Luter, III School of Business of Christopher Newport University (CNU), has been recognized as the 2017 Distinguished Alumni Honoree of the College of Engineering and Business of Gannon University, Erie, Pennsylvania. Spiller received both her Bachelor of Science degree in business administration with a major in marketing and her Master of Business Administration from Gannon. She received her Ph.D. from the University of Missouri–Kansas City and came to CNU as assistant professor of marketing in 1991. Spiller is now in her 27th year of teaching at CNU. Shown here are (left to right) Dr. Keith Taylor, president, Gannon University; Spiller; and Greg Czarnecki, president, Gannon University Alumni Association. The Virginia Peninsula Foodbank expressed appreciation to its more than 170 partner agencies by providing to some of these agencies much needed equipment for their facilities. Eight of their partner agencies, along with some Foodbank staff, are shown in front of their new freezers, refrigerators, storage bins and blankets. 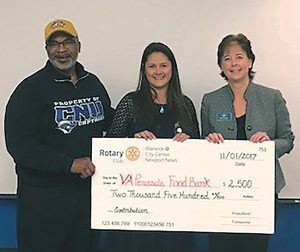 The Rotary Club of Warwick @ City Center presented a check for $2,500 to the Virginia Peninsula Foodbank. This donation will provide 10,000 nutritious meals to those in need. Check proceeds were from the club’s signature charity fundraiser, Bacon Bash, held last May. In addition, more than 25 Rotarians volunteered service hours for the BackPack Program and the Mobile Pantry Program. Pictured from left to right are Kevin Lyles, assistant area governor; Jennifer Daknis, club president; and Karen Joyner, Virginia Peninsula Foodbank Chief Executive Officer. Will Sampson has been named senior vice president/chief information officer of Langley Federal Credit Union. Sampson is responsible for providing vision and leadership for the Information Technology (IT) team, aligning technology initiatives with business goals to improve service delivery and managing the overall development of the long-term technology strategy and short-term technology solutions for the organization. Sampson brings more than 17 years of experience leading operations and technology and is a veteran of the U.S. Marine Corps. Rob Lefkowicz has been named vice president of operations of Langley Federal Credit Union. He will oversee Langley’s operations teams, which include support services, account servicing and loan processing. Prior to joining Langley, Lefkowicz served as chief strategy officer at Park Side Credit Union in Whitefish, Montana. He has earned the Certified Credit Union Executive, Certified Financial Services Professional and Certified Lending Specialist certifications from the Credit Union National Association (CUNA). 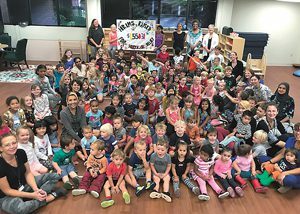 When recent hurricanes devastated communities in Texas, Florida and Puerto Rico, children of the Hampton Roads International Montessori School hosted a bake sale during the school’s 25th anniversary celebration, raising $1,160 and $395 from the sale of its anniversary T-shirts. The money was sent to the Montessori Hurricane Relief Fund for distribution to schools affected by the hurricanes. 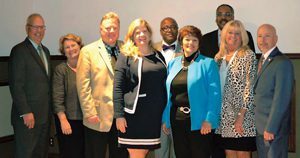 The Peninsula Council For Workforce Development (PCFWD) held its 12th annual board meeting in October with more than 80 board members, community partners and regional business leaders in attendance. A panel discussion followed the meeting with participation from (left to right) Jim Noel, York County; Michele DeWitt, City of Williamsburg; Dave Callis, City of Poquoson; Amy Jordan, James City County; Leonard Sledge, City of Hampton; Florence Kingston, City of Newport News; Matthew James, PCFWD president and CEO; Sherry Spring, Gloucester County; and Mark Stefanick, PCFWD vice chair and Senior Rewards, Ferguson Enterprises, Inc.
Sentara Williamsburg Regional Medical Center and Sentara CarePlex Hospital each recently earned an “A” Safety Grade from The Leapfrog Group for its commitment in keeping patients safe and meeting the highest safety standards in the U.S. The Leapfrog Group assigns letter grades of A, B, C, D and F to hospitals nationwide based on their performance in preventing medical errors, infections and other harms. Developed under the guidance of a Blue Ribbon National Expert Panel, the Leapfrog Hospital Safety Grade uses 27 measures of publicly available hospital safety data to assign grades to more than 2,600 U.S. hospitals twice per year. Clancy & Theys Construction Company has been recognized by the Associated Builders and Contractors, Virginia Chapter, Hampton Roads region for project excellence during the 2017 Excellence in Construction of the Year Awards. The construction company received two honor awards of excellence, one in the Residential Multi-Family category for its Overture Point Chesapeake project in Virginia Beach and the other in the Commercial Residential Renovation (over $1 million) category for the Movement Mortgage project in Norfolk. Bill Goggins is vice president/CEO of the Newport News location. 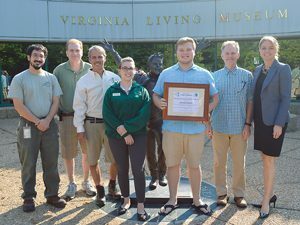 Brendan Player, a Christopher Newport University (CNU) doctoral student, received the first Wason Conservation Scholarship of the Virginia Living Museum (VLM). This honor recognizes a college student who demonstrates ability and achievement in environmental and conservation studies. Named after VLM founder, Harry Wason, the scholarship honors Wason’s commitment to preserving and showcasing the natural resources in our area. Player has volunteered at VLM as an exhibit interpreter at the Touch Tank and in the Virginia Underground. He plans to graduate from CNU in May 2018 with a Masters degree in environmental science. Shown here are (from left) Travis Land, herpetology curator; George Mathews Jr., curatorial director; Chris Crippen, aquarium curator; Larissa Steblen, volunteer coordinator; Player; Michael Meyer, CNU associate professor; and Rebecca Kleinhample, VLM executive director. Dr. Anthony Carter, orthopaedic surgeon at Hampton Roads Orthopaedics & Sports Medicine, has been recognized as the first doctor in Virginia to perform a bi-cruciate retaining total knee arthroplasty with the Journey XR Active Knee System. The bi-cruciate retaining knee is specifically designed to preserve the patients’ anterior cruciate ligament (ACL) and posterior cruciate ligament (PCL). The new design maintains the ACL and PCL, returning patients back to normal kinematics following surgery. The Journey XR Active Knee System provides an advantage over the traditional knee replacement by replicating the natural motion and sensation of a normal knee. Samuel J. Lunsford, CPA and Brittany B. Skeens have joined Malvin, Riggins & Company, P.C. Lunsford, a tax and accounting associate, received his Bachelor of Arts degree in business administration with a concentration in accounting from Saint Leo University. He will be specializing in individual and business taxation. Skeens, a tax and accounting associate, has worked in the industry for several years and has extensive experience in bookkeeping. The top agents for September for CENTURY 21 Nachman Realty’s Peninsula Office were Evelyn D. Staton, top listing agent; Dee Karlsson, top selling agent, top closing agent and top producing agent; and Jody Snider, top referral agent. The top agents for October were Evelyn D. Staton, top listing agent and top selling agent; Melanie Whitehead, top closing agent; Dee Karlsson, top producing agent; and Luther Elmore, top referral agent.